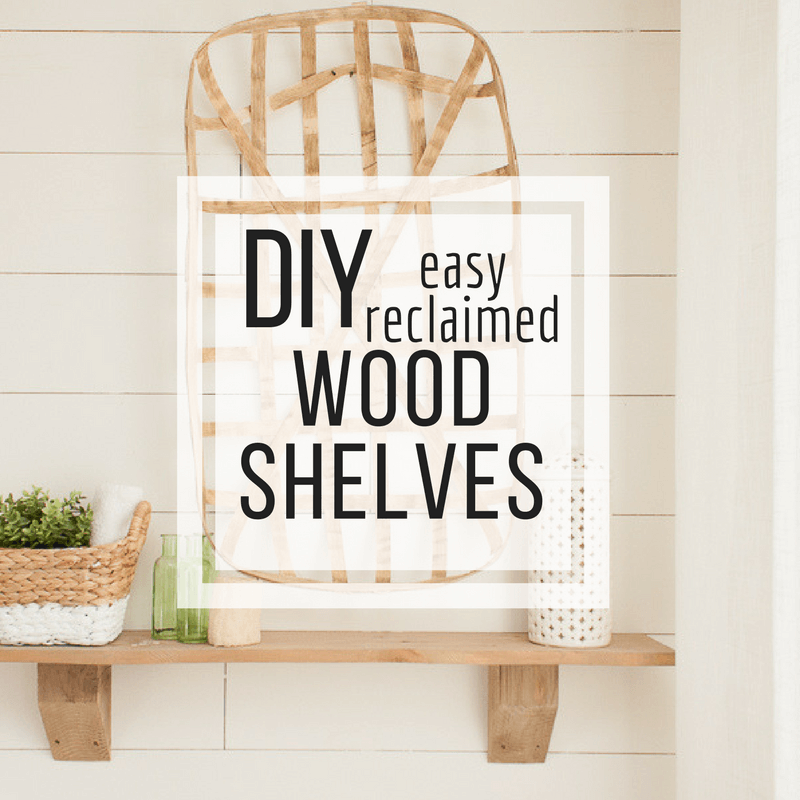 Making easy reclaimed rustic wood shelves is easier than you think! 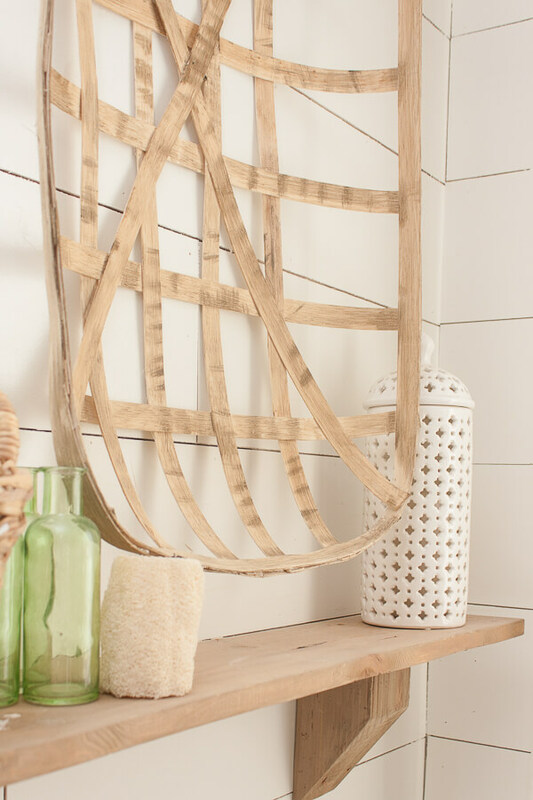 Read on to see how I added farmhouse rustic charm to my bathroom for mere pennies! 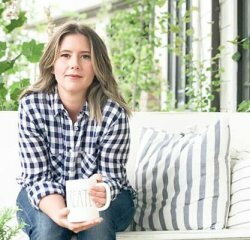 This post originally appeared on Remodelaholic.com. I am now excited to share it with my readers as well. 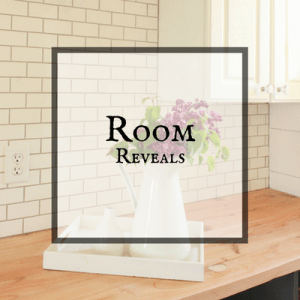 Last year when I remodeled my master bathroom, I had no idea how it would end up. I mean, I had a plan, and knew exactly what I wanted but it is hard to predict that it will all go as planned. One thing I knew is that I wanted to add some rustic wood shelves to the space. With everything else that was going on, the shelves were the easiest part! We re-tiled the whole room including the shower, shiplapped the walls, built a new vanity and new built in storage. The space is light and bright and so functional! 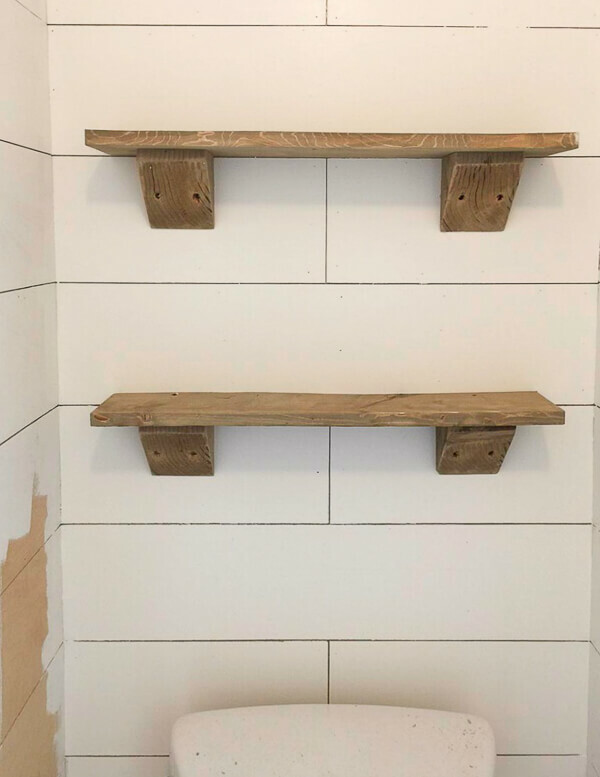 One weekend, after many late nights working on the bathroom, I decided it was time to get working on the rustic wood shelves. 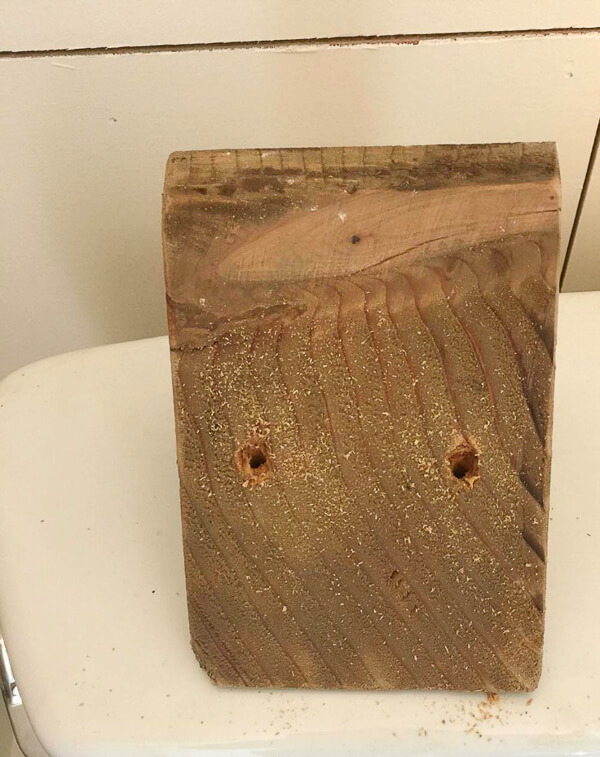 You see, we lucked out a few years ago and came across some old wooden beams that were originally used at a hotel as part of the stairs. They were painted dark brown, and I swear there had to be at least 10 coats of thick brown paint on them. We spent hours and hours sanding the paint off of them in order to use them at my sisters outdoor wedding that we put together near our home. We first used them as benches, nestled in the woods for the wedding. Next, I was able to turn some of this wood into shelves in my laundry room and my dining room. 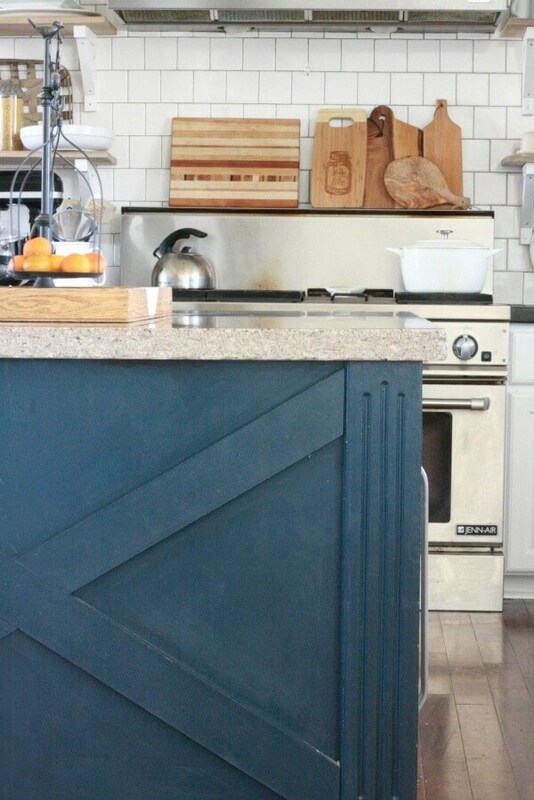 Last we turned some into butcher block counter top in our laundry room as well. 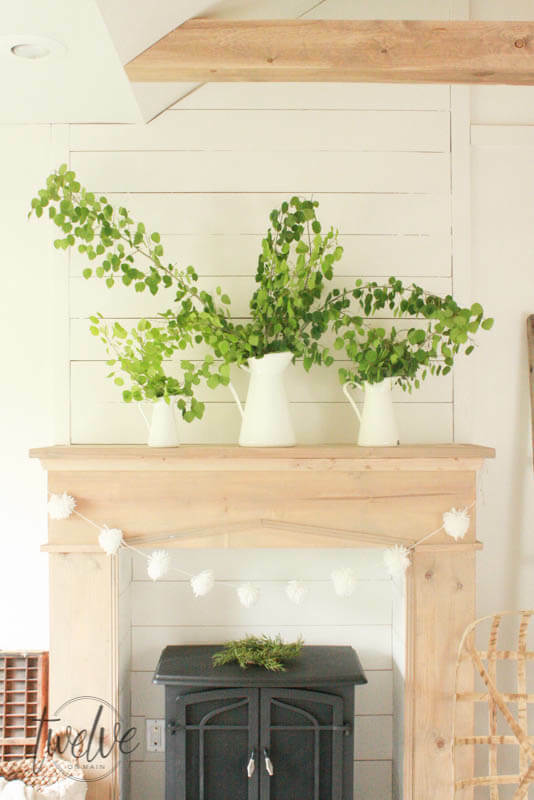 These beams are well used and well loved! It is a stark change from their former home, rotting in a trash pile. We ended up using some more of the beams in our master bathroom remodel by installing one real, very real and very heavy beam in the ceiling and wall. we also used some of it to build our new vanity. 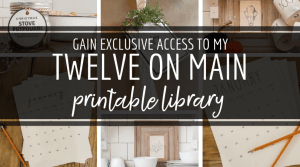 Yes, we multi-purposed all of it! It is so satisfying. 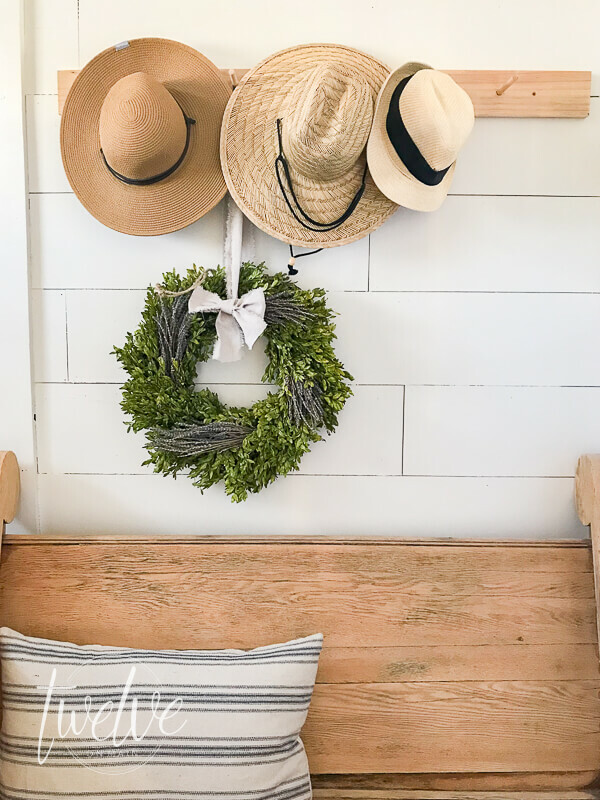 The rustic wood shelves was the last project from one of our old beams and I knew I could use the little scraps we had left to create something lovely. Now, all we had left were a few blocks of wood, but I knew I could make them work with a little bit of imagination. I wanted something that had a rustic look, but still refined enough to look clean in my master bathroom. I wanted simple brackets that had a little bit of heft to them. 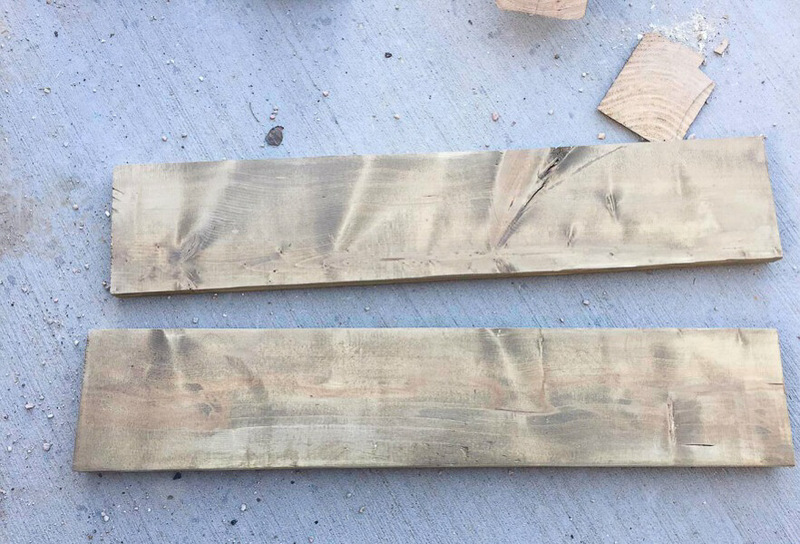 1 by 6 inch pine boards. I got mine in 8 ft lengths. 4×4 (or larger) posts. Mine was an old scrap post that was actually 4×4, but you could use larger or smaller depending on the shelf size. 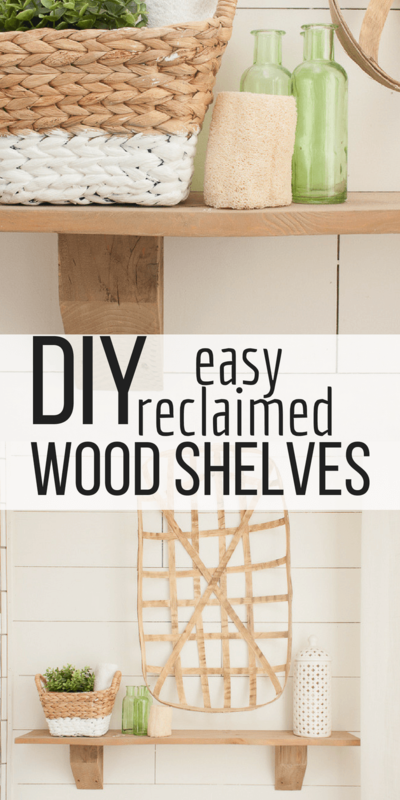 Now, I want to preface this and state that there are so many different ways to make rustic wood shelves and you may have different sizes and shapes. 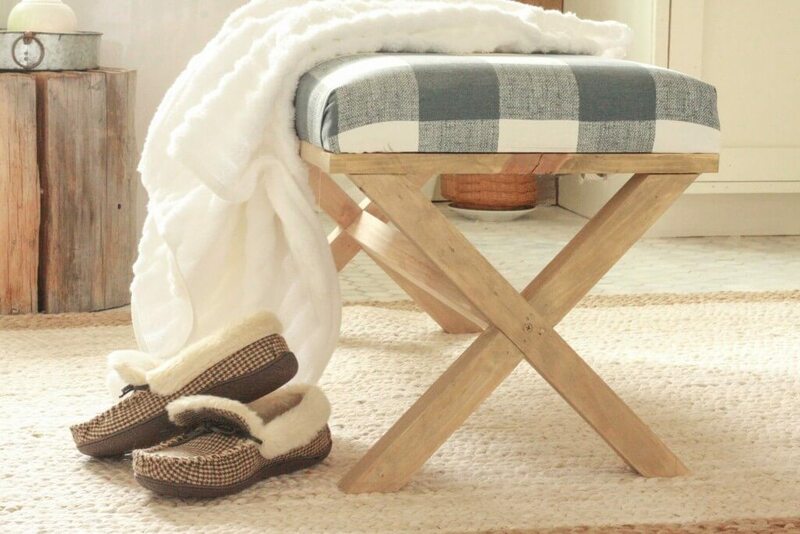 Creating something original is such a fun way to personalize your home. 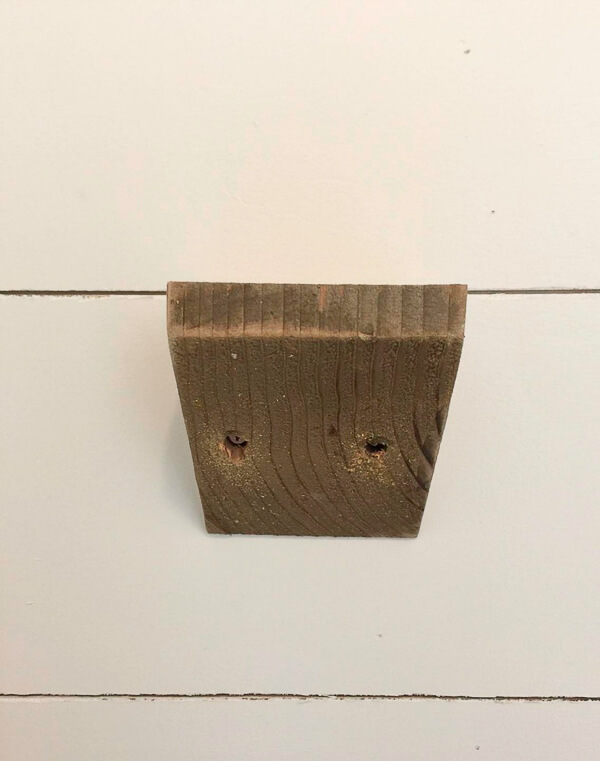 There are many options to creating these brackets, but being creative and using what I had, I found an old post that was about 6 ft long and was approximately 4 inches by 4 inches. I used this wood to cut my corbels out of. My miter saw was set to the sharpest angle which was about 51 degrees. We cut the pieces of the post down to 4 2/3 inch lengths for the toilet room shelves. Once they were cut, I then measured down 3/4 inch and marked it. Next, I cut the wood piece on that line with the miter saw set at 51 degrees. The plan was to make some for my toilet room and one for above my bathtub. I decided to make the one above my tub slightly larger, thus I made a larger corbel. I cut them at 7 1/2 inches long and cut the angle 3 inches down the post. It was still done exactly the same way, I just made it taller. Once I had all the brackets cut, I gave them all a good sanding. Then I used a hammer to beat them up a bit. I then stained/washed the wood with my favorite weathered wood stain. This is a stain I have made up myself and I use of so very often in my home. 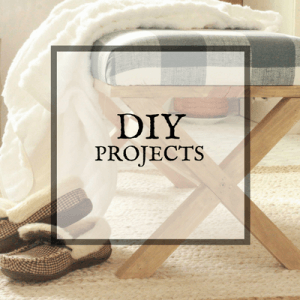 I have used it on my DIY X bench, my open shelves in the kitchen, and on my vanity in my master bathroom. After I had the corbels all ready to go, I drilled to holes all the way through them. This is how I secured them to the wall. The reason I decided to use this method, is that it gives them a more raw, rustic/industrial vibe. I even left the screws visible and did not putty the holes. If you are looking for a more refined look, you can putty the holes with stainable caulk and you will not see the screw holes. I was not so concerned with that. I did use some new 1 by 6 inch pine boards. They are incredibly reasonably priced, especially if you get the white common board. Once you have everything ready to hang on the wall, it is important to find the studs in the wall, or use drywall anchors. 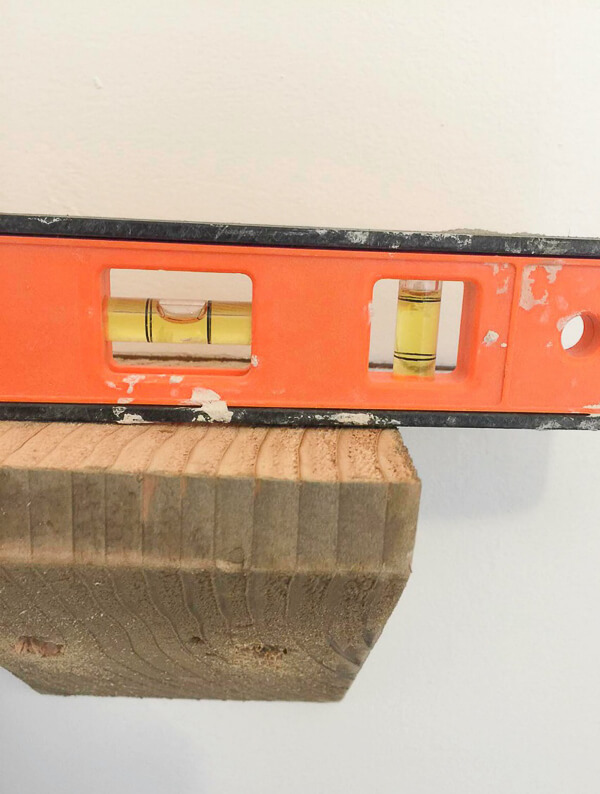 I used my stud finder to find the studs and marked them. There may be a little adjusting here or there to make sure they are centered. If you cannot find studs in the place you are hanging them, use drywall anchors. 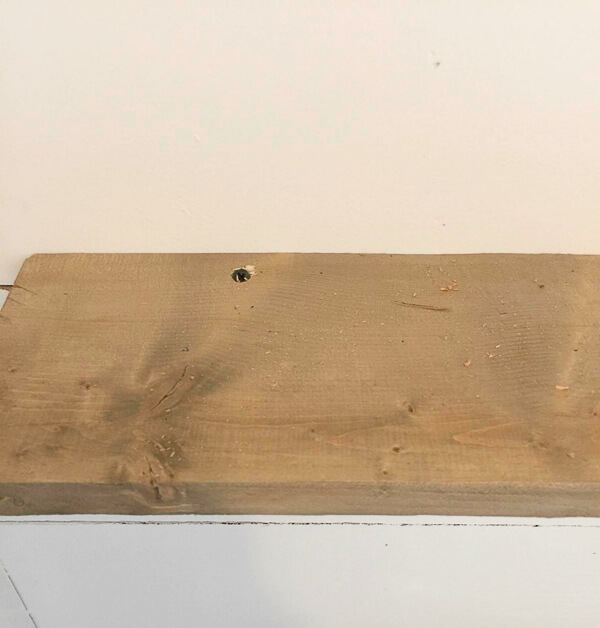 You can mark the spot on the wall by pushing a smaller drill bit through the holes that you pre-drilled and making a mark on the wall. Using a level to make sure they are straight before securing them in to the wall will provide a nice level surface. Now that the corbels are secured into the walls, its time to add the shelf. I laid the 1 by 8 pieces atop the corbels, centered them and then screwed them in through the top of the shelf. 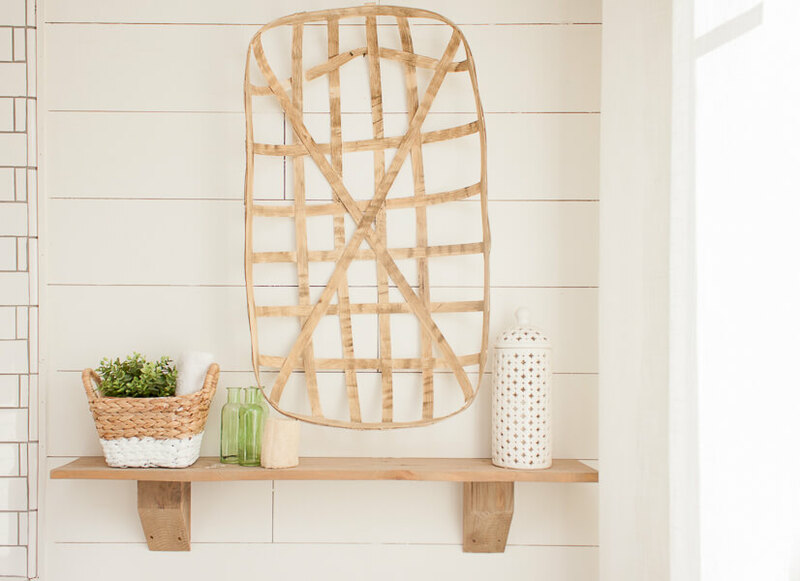 I love the rustic look these reclaimed shelves have. We were so thrilled with how they were turning out. 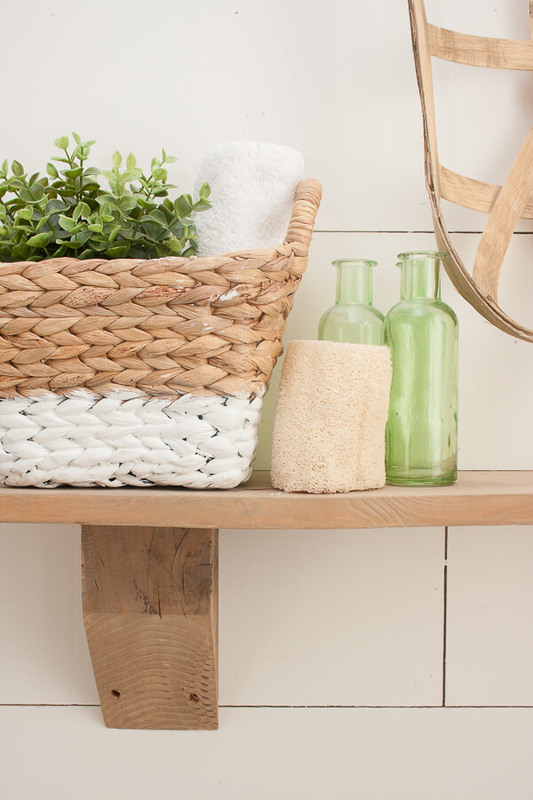 It was time to finish up with some touch ups in the bathroom and style my new rustic wood shelves. I use these shelves to store extra toilet paper as well as lady paraphernalia. 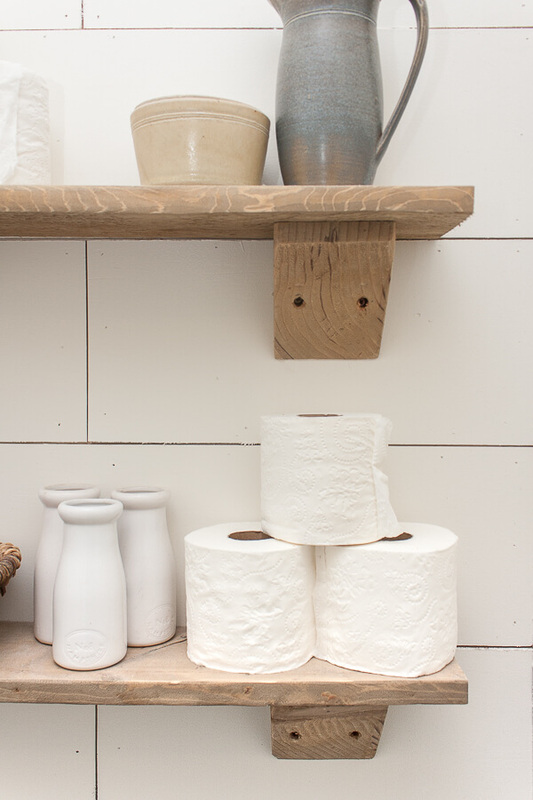 There’s no crime in styling toilet shelves either. It makes everything better. For the shelf I installed near out bathtub, I wanted to keep it pretty. 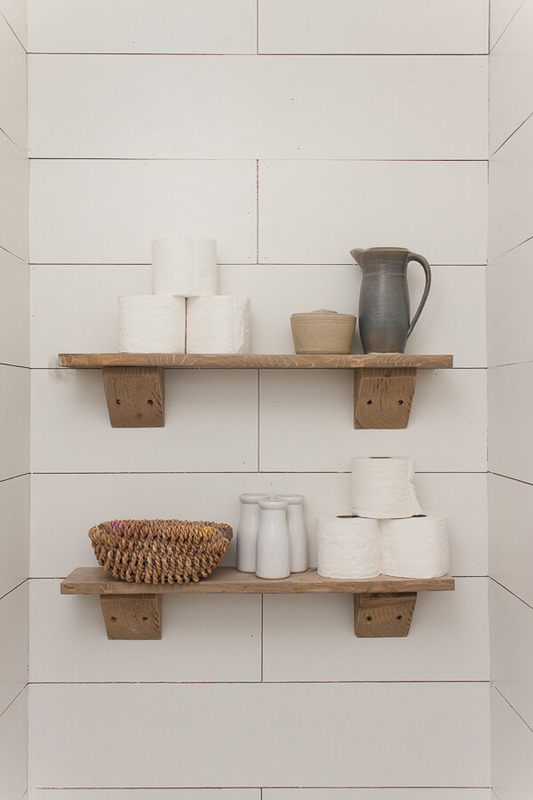 I love these rustic wood shelves and I am so very excited about how they look in my bathroom. 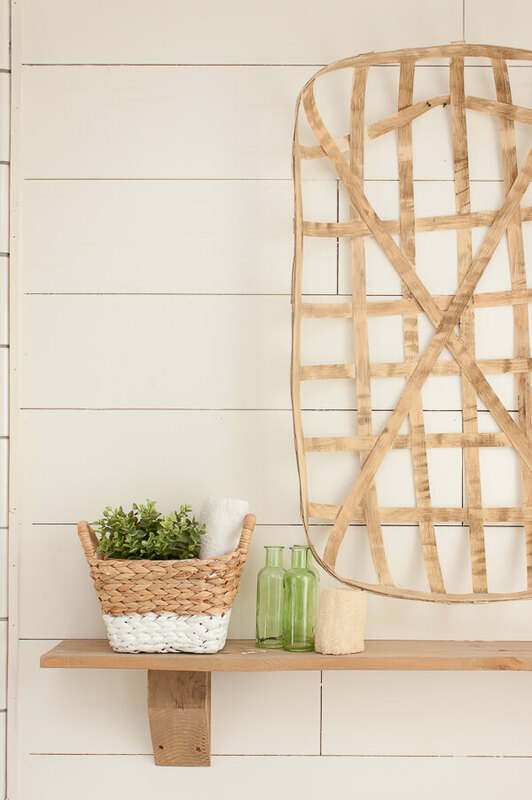 Just the right amount of rustic against the shiplap walls and subway tile in our shower makes this one of my absolutely favorite views. Its a good thing its what I get to look at while I am taking a bath. Is there a space in your home that you would like to install some unique rustic style reclaimed wood shelves? These were super easy to create and I was able to do it all myself. One huge piece of advice I would give is take the lead from the actual wood itself. I did not try to fit a square peg in a round hole. I knew there were only certain ways I could use the pieces of wood I had, and I used those to my advantage to create some pretty spectacular reclaimed wood shelves. 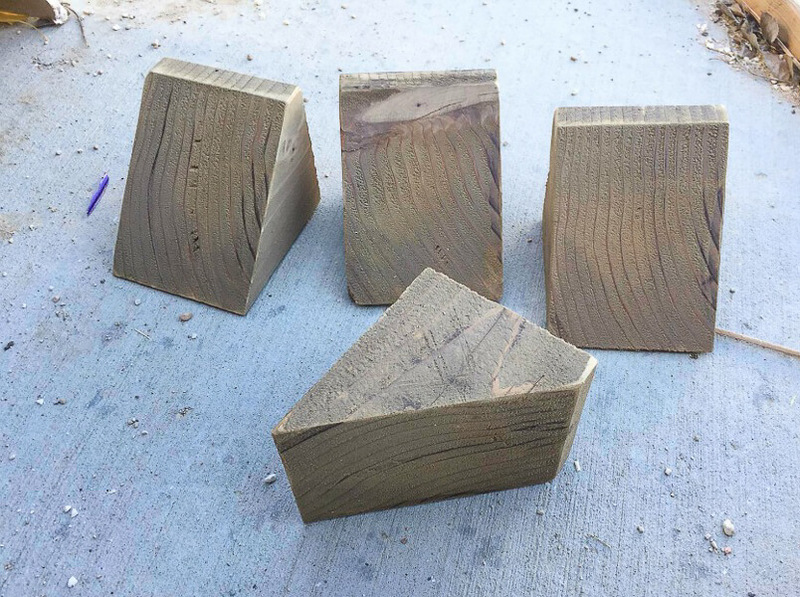 So, if you have some reclaimed wood that may have different plans, use your imagination and create something truly unique. 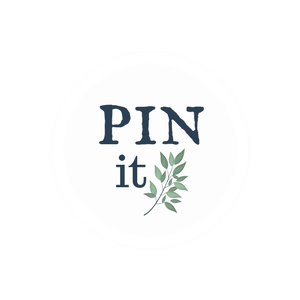 And if you are a self proclaimed “no imagination” kind of person, shoot me a message and I will gladly help you come up with an awesome idea! Make sure to save this for later and share it with your friends! I’m trying to put together a shelve. Found your tutorial informative. Thank you for great information.